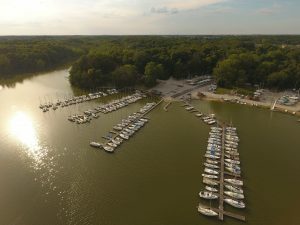 ECSC was formed in 1969 at the request of the Indianapolis Parks and Recreation Department to promote recreational use of the recently built Eagle Creek Reservoir. Our club has about 255 members. Our property holds 175 floating boat slips and 150 “dry” slips (boats on trailers). Please see our Social page for a list of social events. We have an active racing program with several PHRF fleets and some one-design fleets. Please see the Racing or Fleets pages for a list of active fleets. We have weekly races on Wednesday nights and Sunday afternoons. Wednesday night races are followed by hot dogs and hamburgers for all. 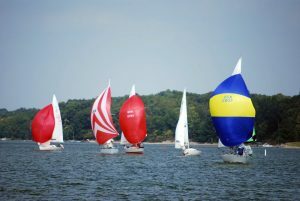 Our racing program runs several weekend regattas throughout the year including, The Indiana Mayors Cup, The Indiana Governors Cup, The Hornback Regatta, The Indy 200 Regatta and the ECSC Regatta. 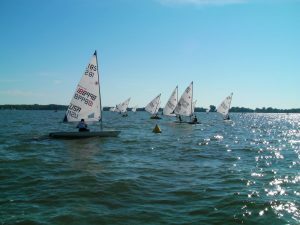 We have an active Junior program including a junior sailing camp and a Junior racing team that travels to regional regattas throughout the Midwest. Follow this link toget information on our Junior programs. Please check out our club history and facilities to the right. Then click on Join to see our various membership types and fees schedule. Thanks for checking us out. We hope to see you soon.